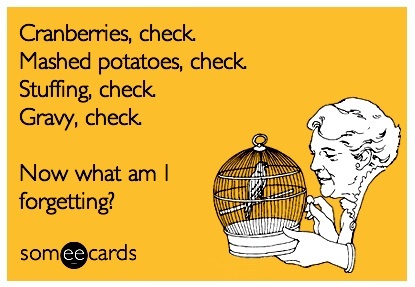 Posted on November 21, 2012 by Michelle M.
This entry was posted in Budgie food, Holiday Fun and tagged budgie, Cooper, holiday fun, parakeet, someecards, Thanksgiving by Michelle M.. Bookmark the permalink. Budgies for Thanksgiving? That’s terrible! The feather to meat ratio is way too high. We know budgies have great taste, but don’t know if they taste great.